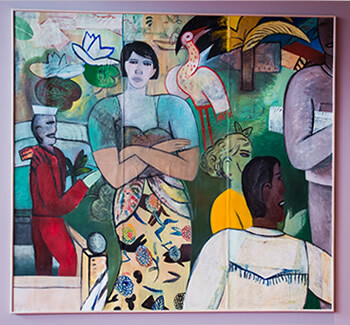 Extraordinary works of art can be viewed throughout McCaw Hall's lobbies and in the Kreielsheimer Promenade. 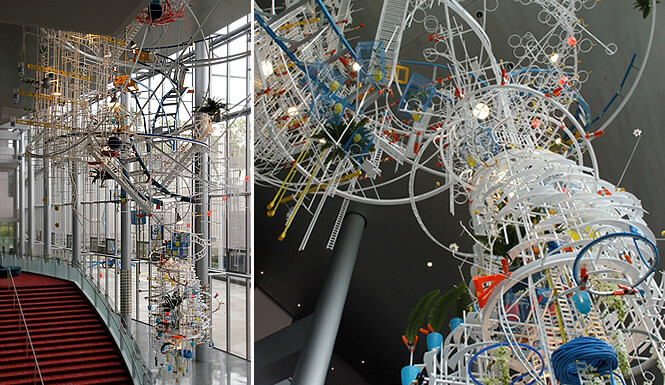 New York artist Sarah Sze created An Equal and Opposite Reaction, suspended in the north end of the McCaw Hall. Each section of the suspended sculpture is constructed of hollow aluminum bars, filled with highly articulated fabricated parts and found objects, such as pushpins, rulers, zip ties, ladders, extension cords, industrial clamps, faux flowers, and tape measures. The vortex structure of the work sweeps the viewer’s gaze up into the space above. Purchased for Marion Oliver McCaw Hall with Seattle Center % for Art funds. “Guy Anderson is one of the major names in the “Northwest School” of painting. The shapes and earth tones of this painting are typical of his work and refer to the unity of life-forms. Symbolic, swirling forms and floating figures are blended together in a cosmos-not seperated but interrelated. The cellular shapes enclosing his figures are derived from Pacific Northwest Indian art. Anderson’s work has also been influenced by Asian philosophies.” — Excerpt from Art in Seattle’s Public Places, An Illustrated Guide. Gift of Mr. and Mrs. William S. Street, to be located in the Opera House. Mark Tobey, generally regarded as the foremost painter of the Northwest School, lived in Seattle from 1923 to 1960. His work is strongly influenced by Asian art and philosophy. He, in turn, became an important influence on other artists of the region. 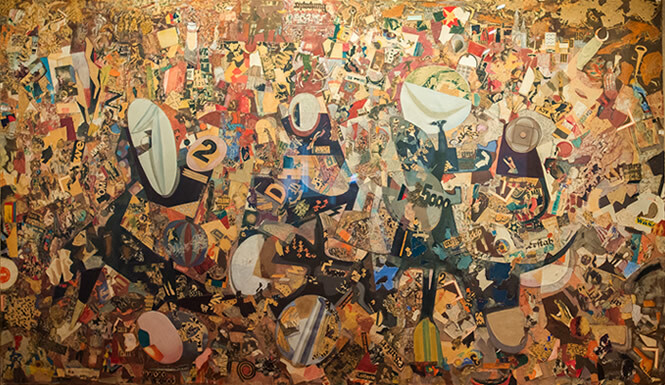 In Journey of the Opera Star, reputedly his first collage, Tobey combines images and text from a number of sources to create an abstract map to an antic world of performers and performances. In the lower right hand corner, Tobey placed a photograph of himself casually smoking a cigarette, both watching and participating in the spectacle he has created. Gift of Mr. and Mrs. John H. Hauberg in 1964. The mural was commissioned by the Haubergs for the Fair, but it was delivered two years later. Tobey’s only full scale public work in Seattle. This work, based upon the poem of the same name by Wallace Stevens, was a major commission in 1984 for the artist. With this work, Spafford “wanted to give a sense of what visual art can do that the performing arts can’t do.” He is referencing the sequential nature of music and theater by splitting the work into 13 separate panels (one per stanza), echoing the “act” or “movement” of theater and music. Commissioned by SAC/Northwest Special Collection Purchase. 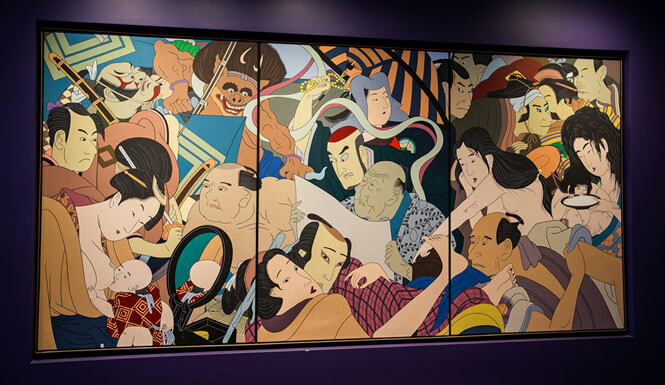 Roger Shimomura, a third-generation Japanese American, creates paintings and performance pieces blending an ironic mixture of Japanese imagery and American popular culture. A native of Seattle, he and his family were sent to an internment camp for Japanese Americans during World War II. Over the past decade, Shimomura has devoted much of his work to exploring the emotional and psychological hardships of the internment experience based on the diaries of his grandmother. More recently, however, he has taken a more lighthearted approach to the serious themes of xenophobia, racism, and cross-cultural interface, consistently drawing our attention to the sometimes hilarious ways in which different cultures overlap. Gift of Mrs. John A. McCone, for placement in the Seattle Opera House. Gift of Mr. Kenneth B. Colman. Ray Jensen began his career working in wood, as well as watercolor and ceramics. He received his B.A. at the University of Washington in 1953; his M.F.A. from Cornell University in 1956. He taught drawing, 3-dimensional design and sculpture, including lost wax foundry, at Bellevue Community College from 1967-1994 and in 1988, he received their Outstanding Achievement in the Arts Award. This is his second major public art installed in Seattle. His first, The Pursuit of Knowledge, is installed at the Rainier Beach Public Library. Gift of Mrs. Charles E. Stuart. Purchased for the Opera House with Seattle Center % for Art funds.